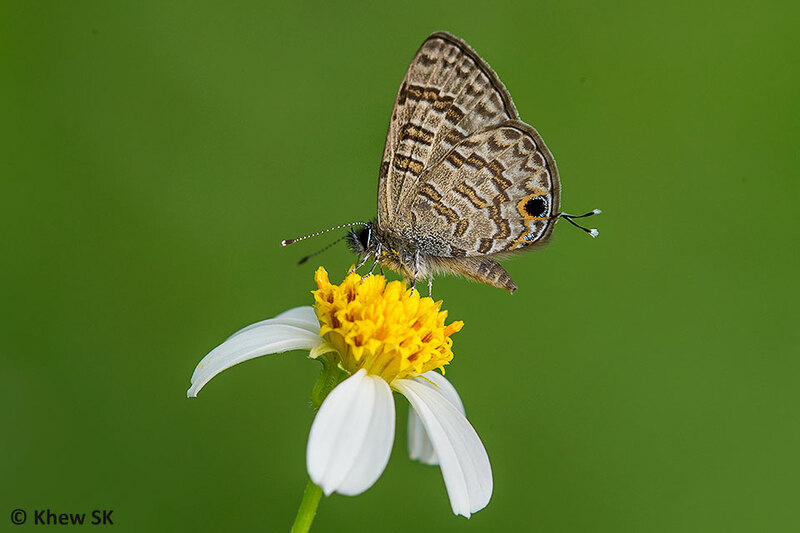 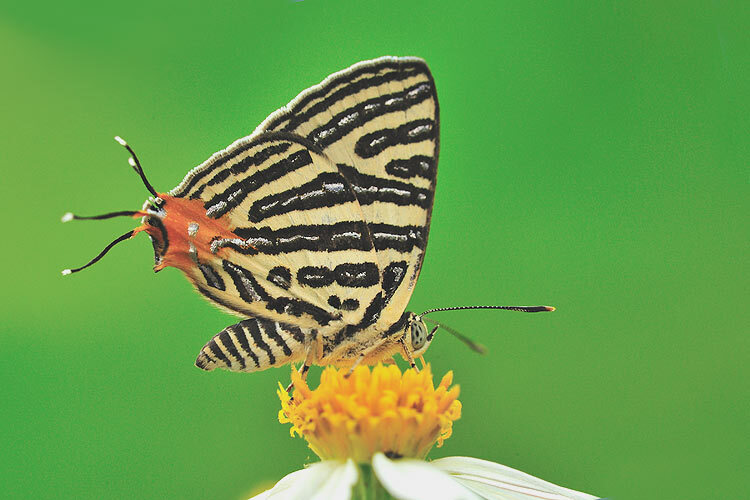 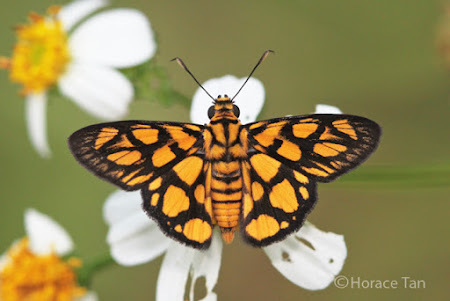 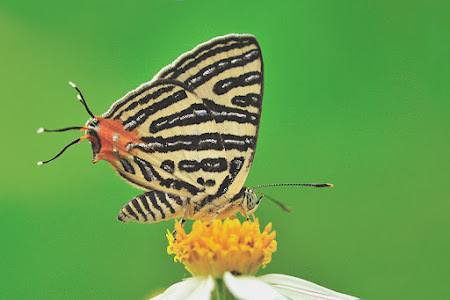 In the 7th instalment of the series Butterflies' Favourite Nectaring plants, we feature an invasive weed that has become quite common in the wastelands and even cultivated gardens in Singapore. 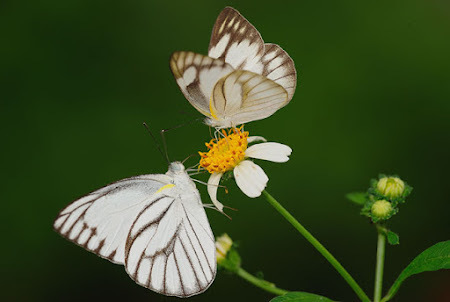 It is interesting to note that two or three decades ago, this plant (usually split into two different species) was largely unknown in Singapore. However, in recent years, it has somehow become quite widespread across the island. 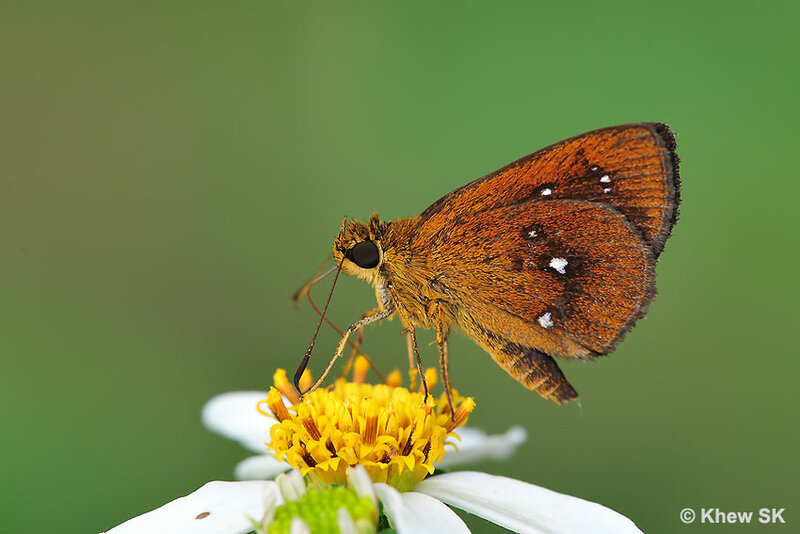 The plant that we are referring to, called the Spanish Needle (amongst a host of many other common names), is one of the favourite nectaring plants of butterflies. 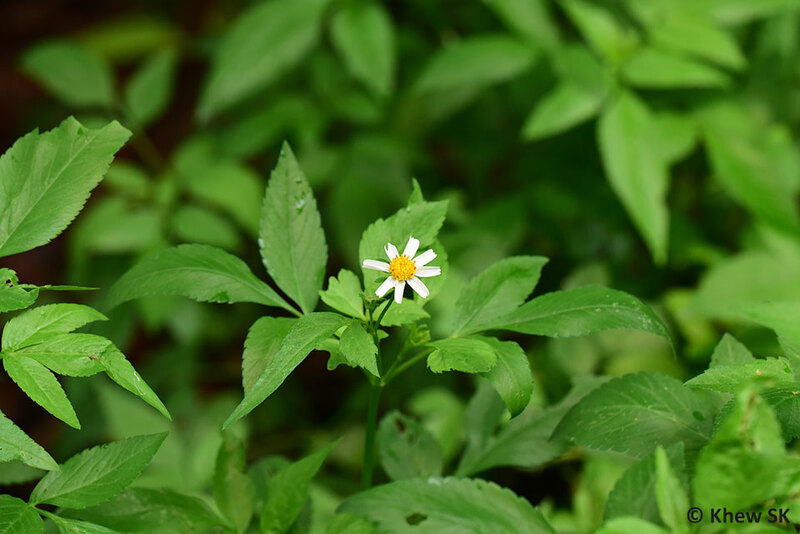 It is believed that there are two different species found in Singapore - Bidens pilosa and Bidens alba. The two species are almost indistiguishable in the field, and some botanists have lumped them as one species, whilst others believe they are hybrids of the same species. 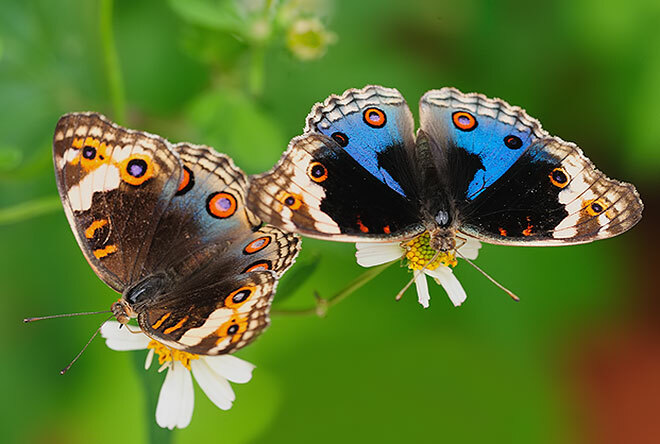 Due to their variability and existence of many hybrids for both species, we will, for all intents and purposes, deal with both species as a group in this article. English Common Name : Shepherd's Needle, Spanish Needle, Romerillo, Common Beggarticks, Hairy Beggarticks, Cobbler's Pegs, Devil's Pitchforks, Black Jack. 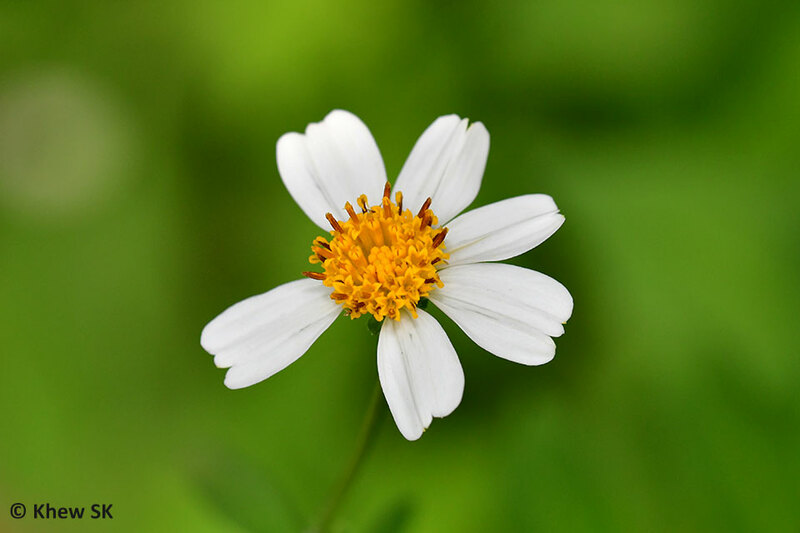 b) Ray florets absent or 4-7 per head, rays 2-8 mm long: Bidens pilosa. 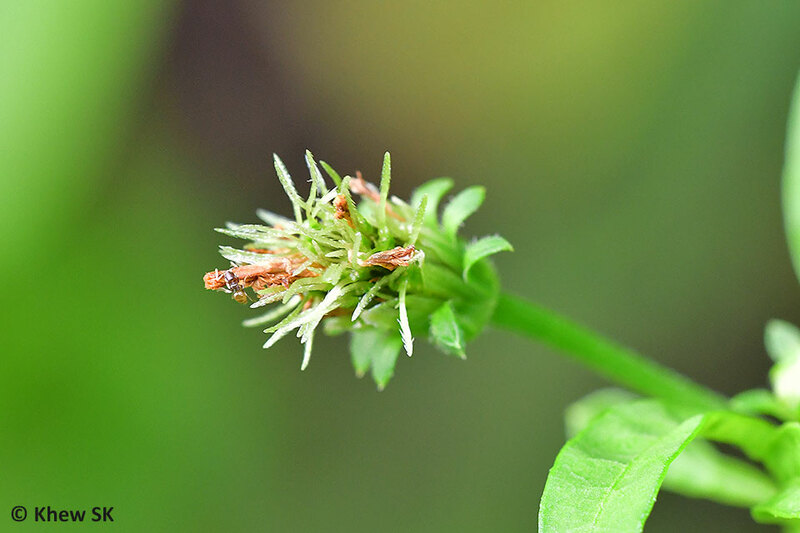 As of January 2012, the United States Department of Agriculture (USDA) plants database continued to maintain the separation of species, but the Integrated Taxonomic Information System (along with the Flora of North America) has adopted a more recent classification which rolls B. alba and B. odorata into B. pilosa. 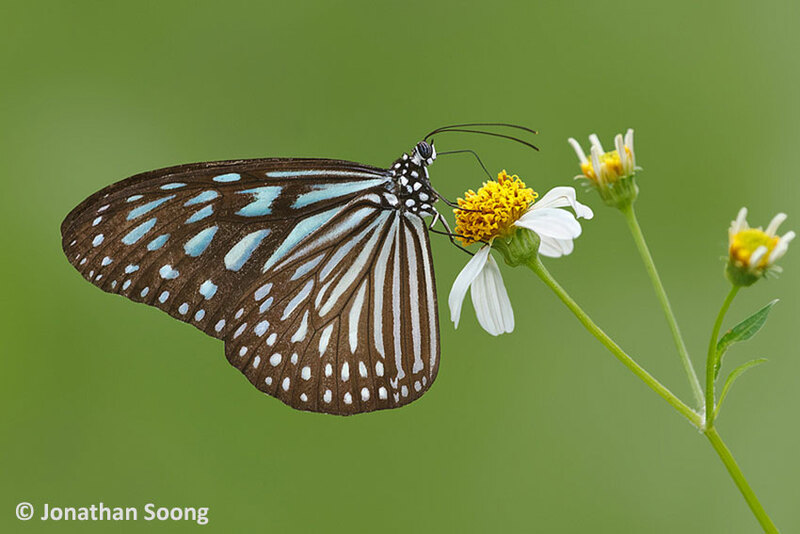 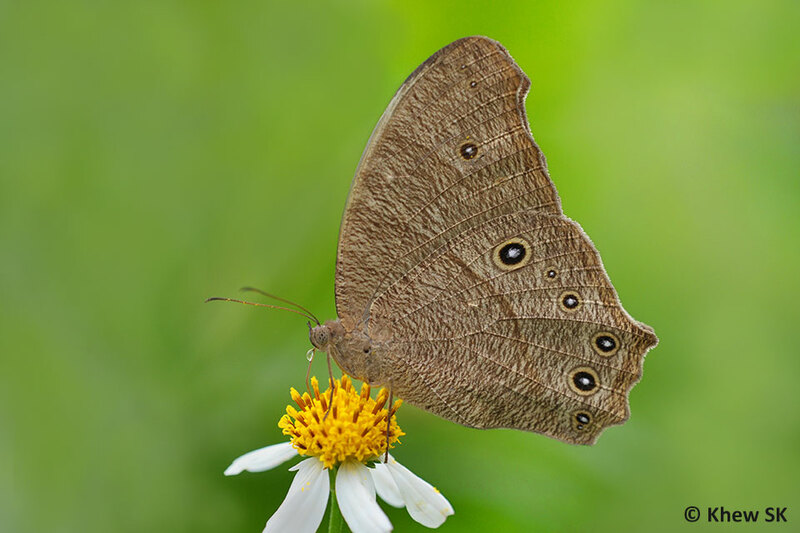 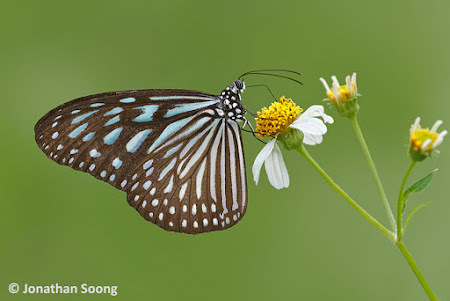 Whilst the scientists continue to lump or split the two species, let us take a look at this weed and how it affects butterfly populations in Singapore. 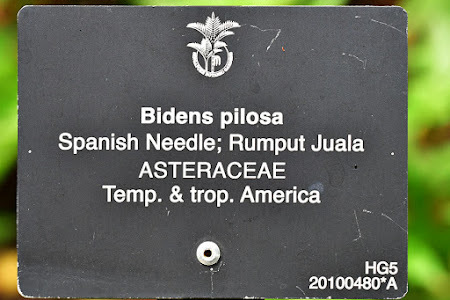 Bidens pilosa/alba is an annual herb that grows erect up to about 1.5 m in height . 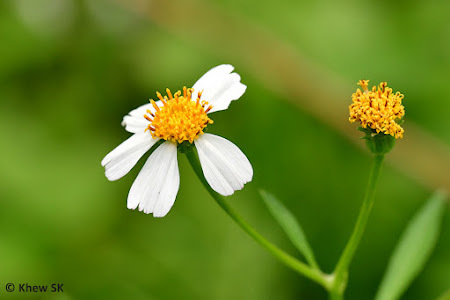 It is easily recognised by white petalled flowers with a central yellow disc florets. 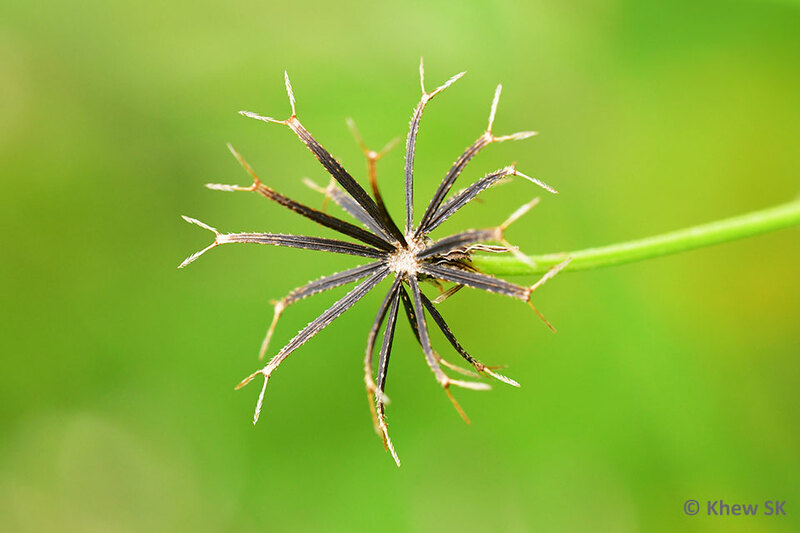 The elongated fruits are bristly achenes (one-seeded fruits) with mainly 2-5 awns (barbed hooks) at tip. 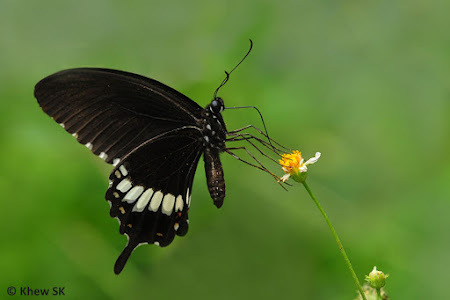 The fruits are black when mature, sticking onto fur or feathers and dispersed by browsing fauna via their hooked bristles that embed themselves in people's clothing as they brush past the stems. Two fruits/seeds of the Spanish Needle. 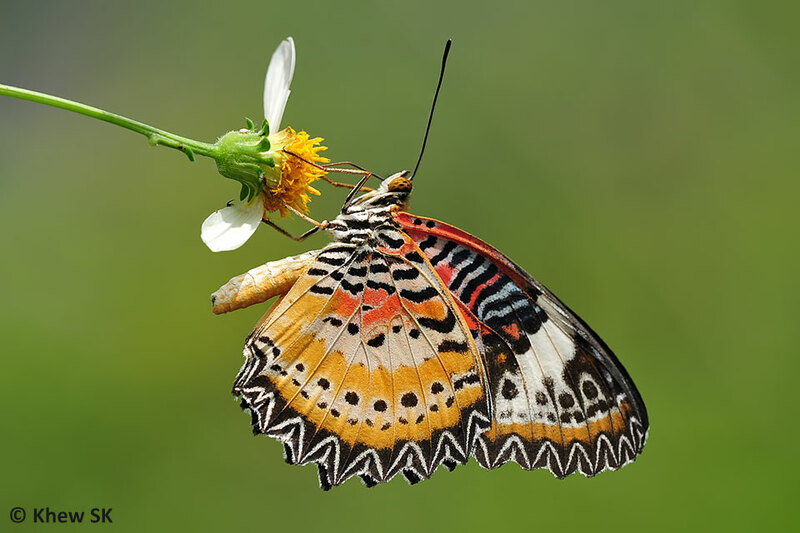 Note the top fruits have only two awns (barbs) whilst the bottom shot shows the fruits with three awns. The genus name Bidens means twice' (bi) and 'toothed' (dens), which probably refers to the hooked fruits of the plant. 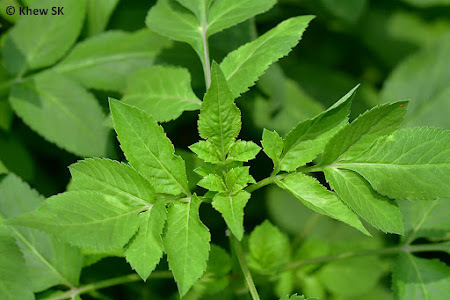 The leaves of the Spanish Needle are oppositely arranged and pinnate in form with three to five dentate, ovate-to-lanceolate leaflets. The leaf edges are serrated/toothed. 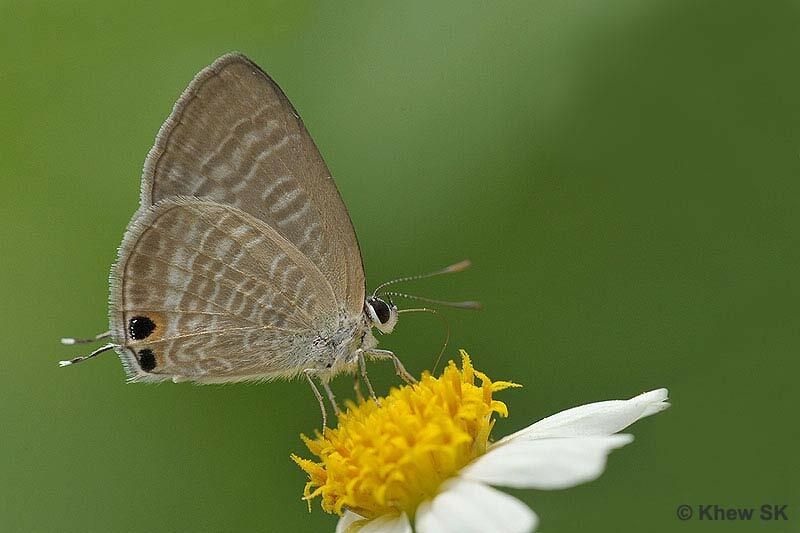 The petioles are slightly winged. 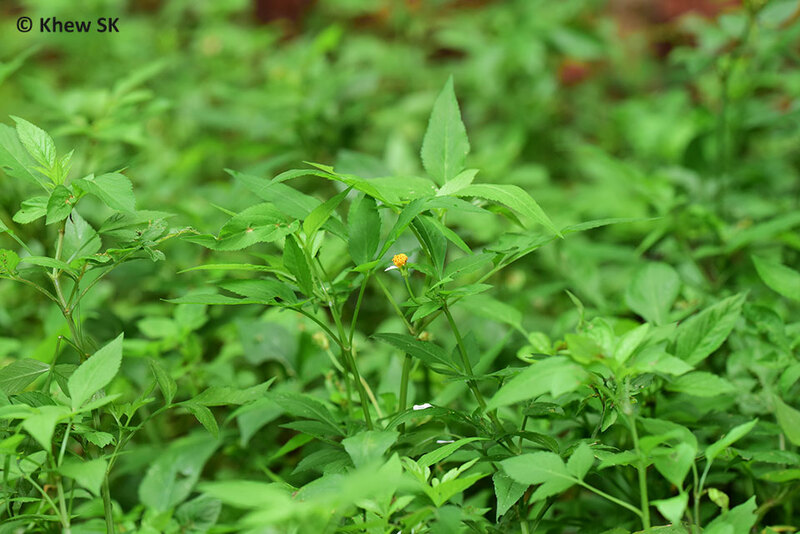 Stems are mostly hairless and green to purplish in colour. 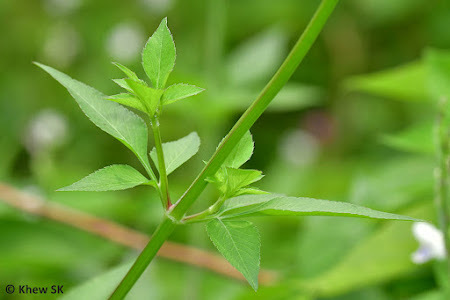 The green serrated leaves of the Spanish Needle. 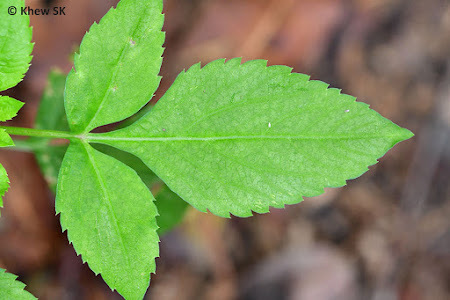 The bottom shot shows young leaves growing from the stem. 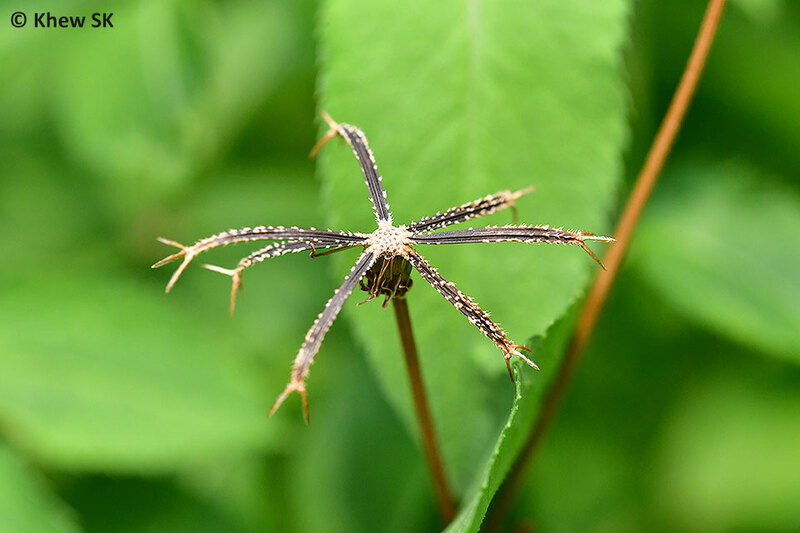 That the Spanish Needle is often referred to as a weed is testament to its tenacity and robustness in surviving in harsh environments. It is a fast-growing, fast-spreading weed due to its enormous number of seeds and the ability to re-grow from stems. 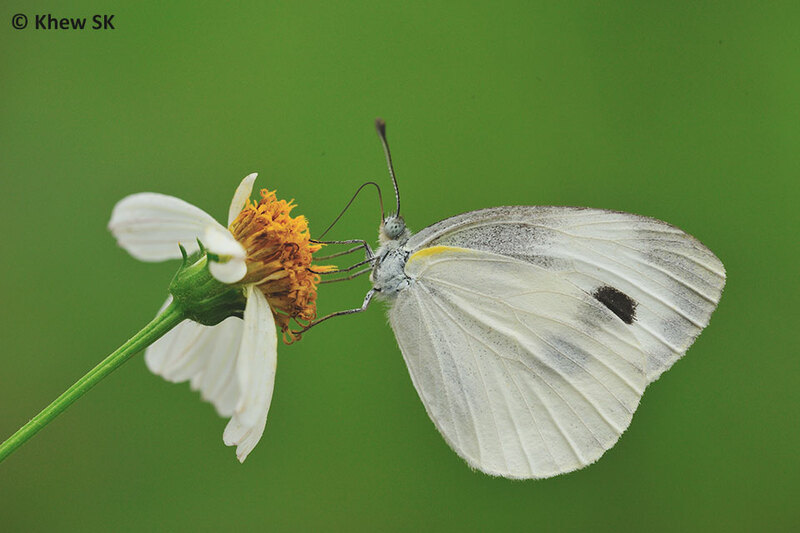 It can have up to 6,000 seeds per plant and the seeds can remain viable up to five years. The plant itself is edible, and the young leaves can be consumed as a vegetable. 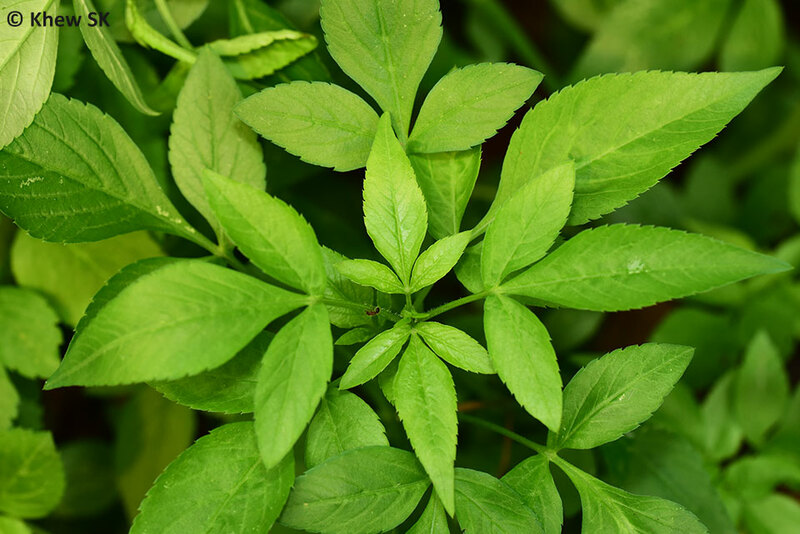 The young shoots and leaves can be added raw to salads whilst the shoot tips can be brewed as a tea. Almost two hundred compounds have been isolated from the Spanish Needle, especially polyacetylenes and flavonoids. 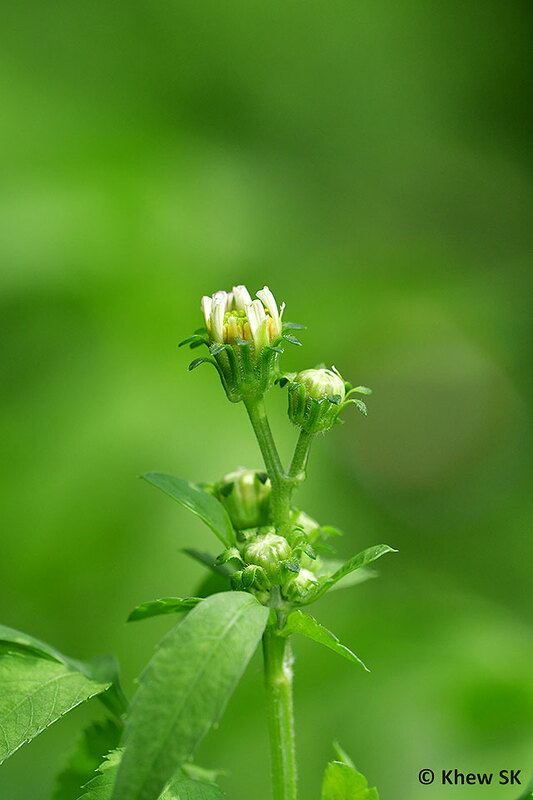 The plant contains the chalcone okanin and ethyl caffeate, a hydroxycinnamic acid. 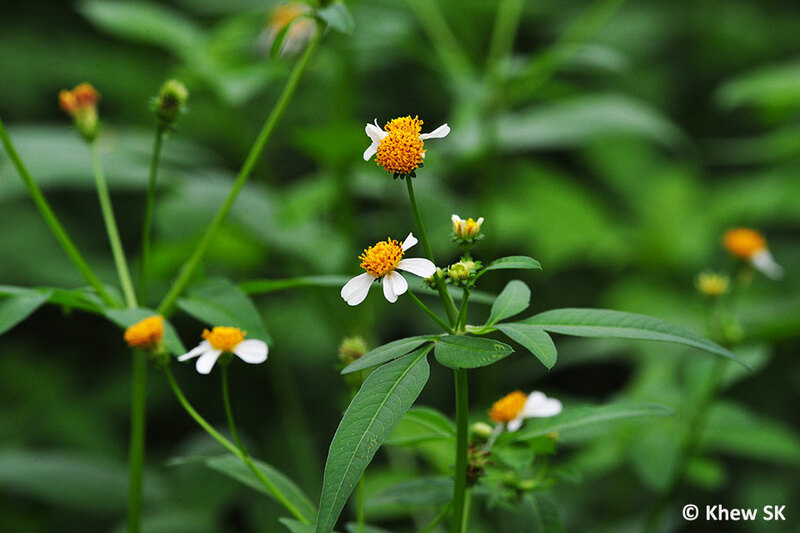 It is considered a medicinal plant in many cultures and is used to treat ailments from minor fresh wounds and ulcers, to treat thrush and rheumatism. 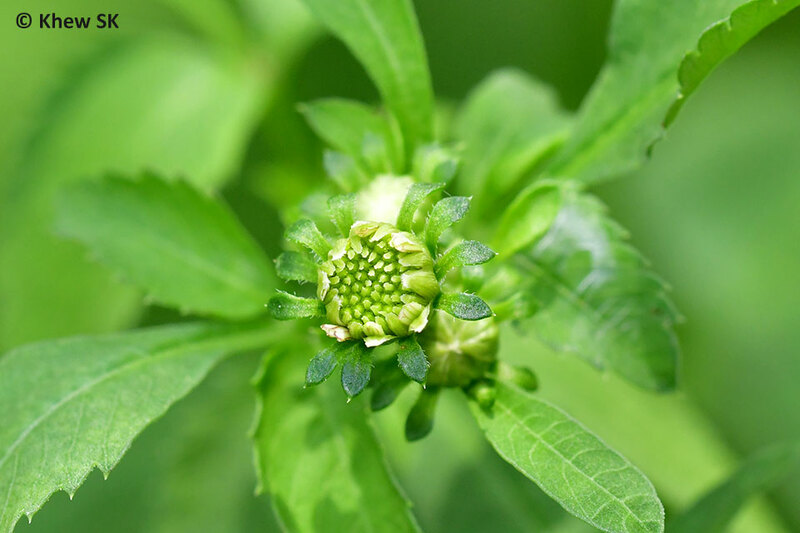 It is also used in enemas for intestinal ailments. 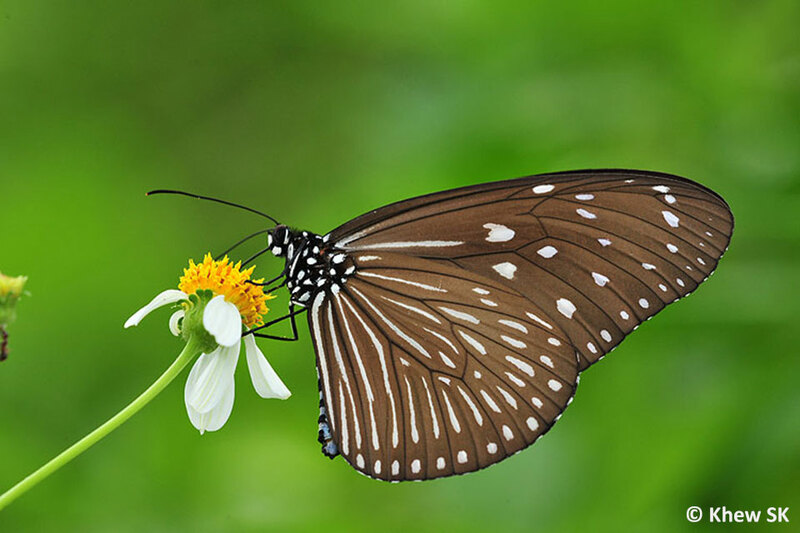 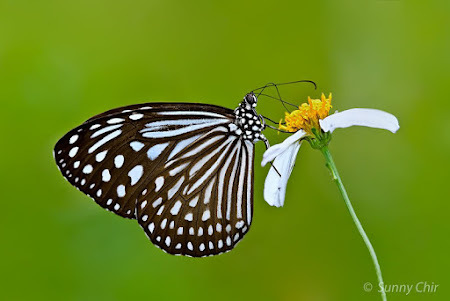 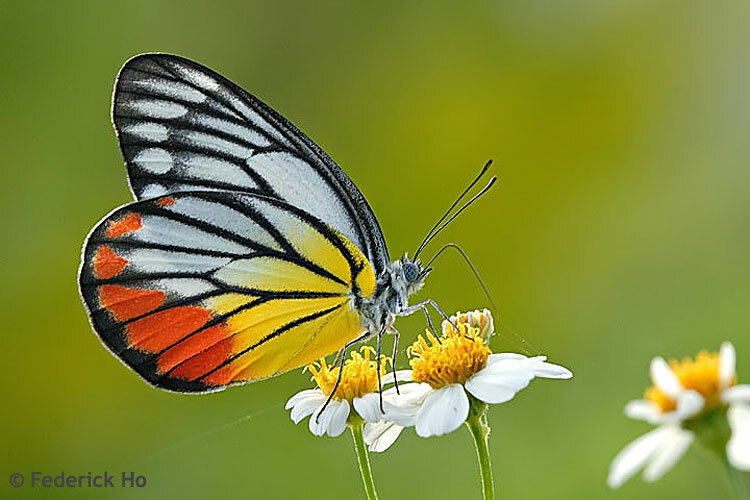 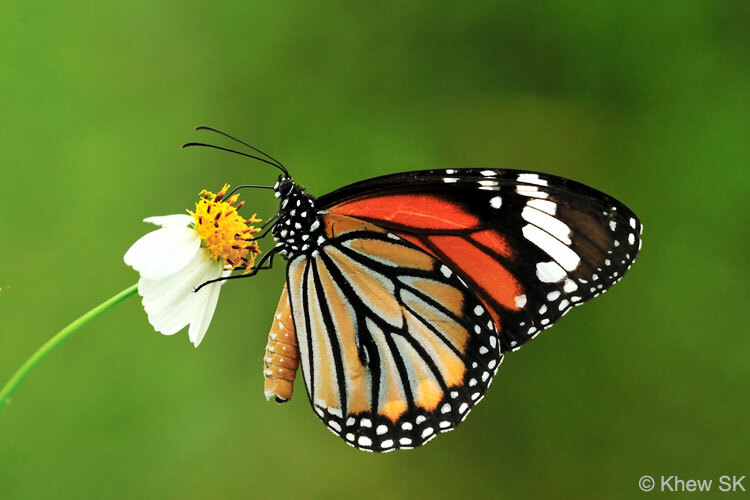 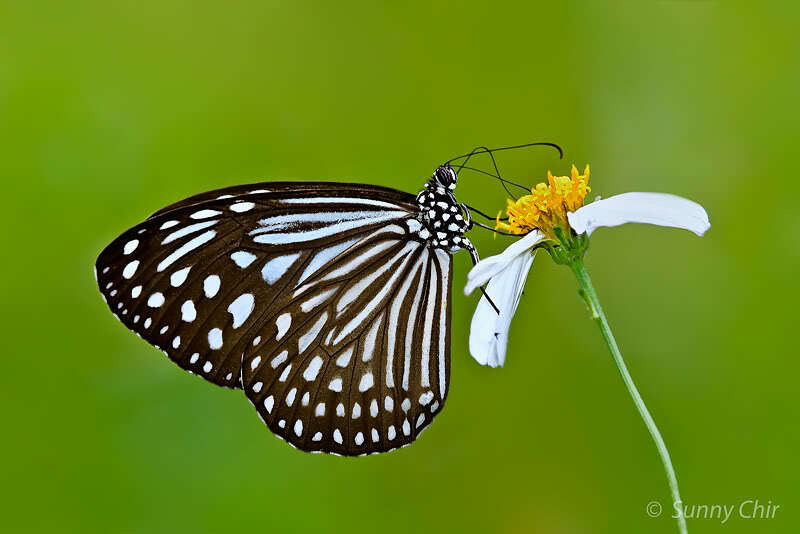 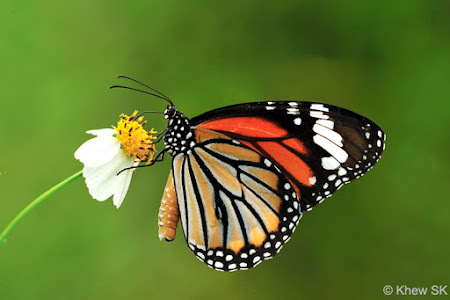 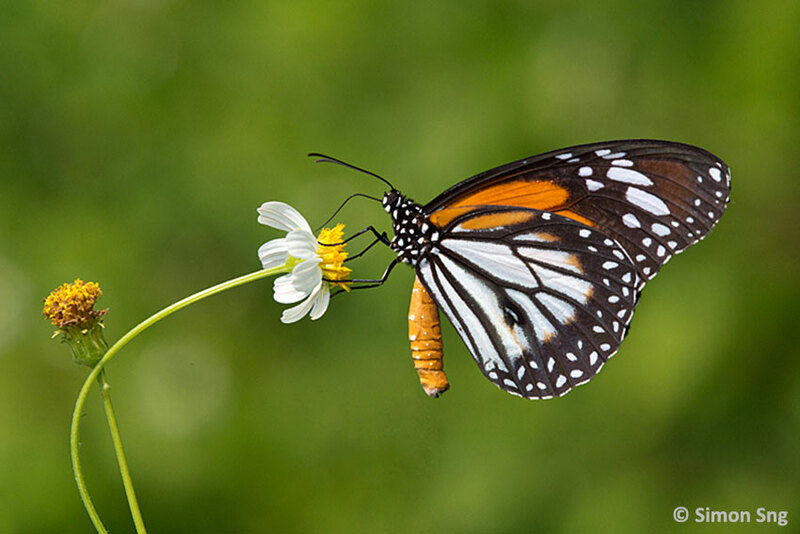 The flowers contain a high amount of nectar, and a wide variety of butterflies is attracted to feed on the flowers. It is interesting to note that the size of the butterfly and length of its proboscis do not appear to be critical to the butterflies' ability to feed on the Spanish Needle. 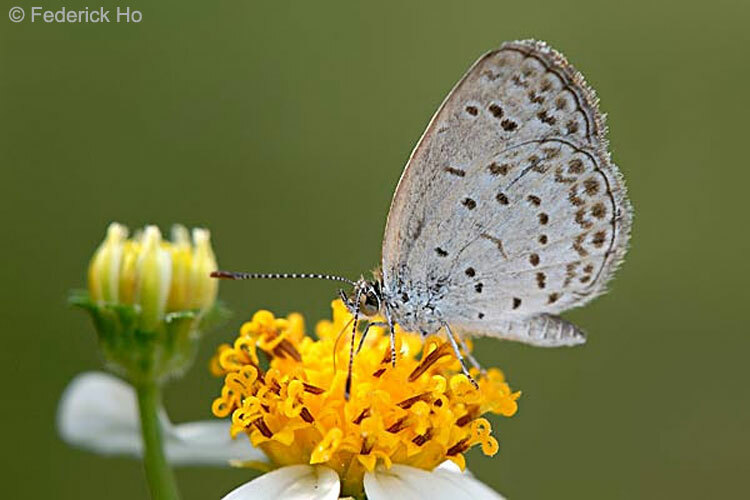 We have observed a good range of butterfly species from the large Papilionidae to the diminutive Lycaenidae and the speedy Hesperiidae feeding on the flowers of the Spanish Needle. Amongst the Swallowtails, the larger butterflies like the Common Mormon, Common Mime and Banded Swallowtail have been observed feeding on the Spanish Needle flowers. 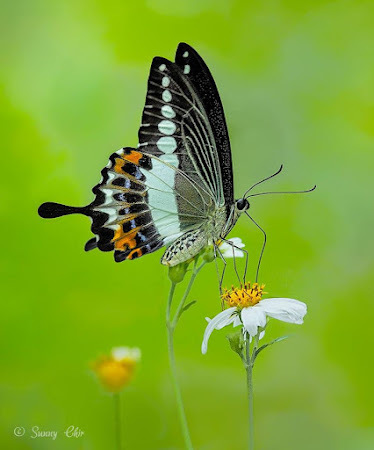 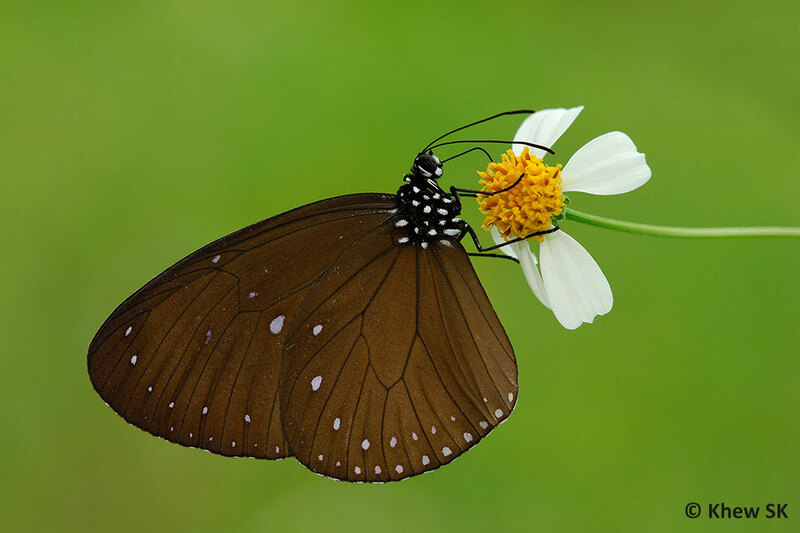 The long proboscis of the Swallowtails can be observed as these large butterflies balance on the flower whilst still in flight with their forewings flapping whilst their hindwings are used to counterbalance the butterfly as it feeds. 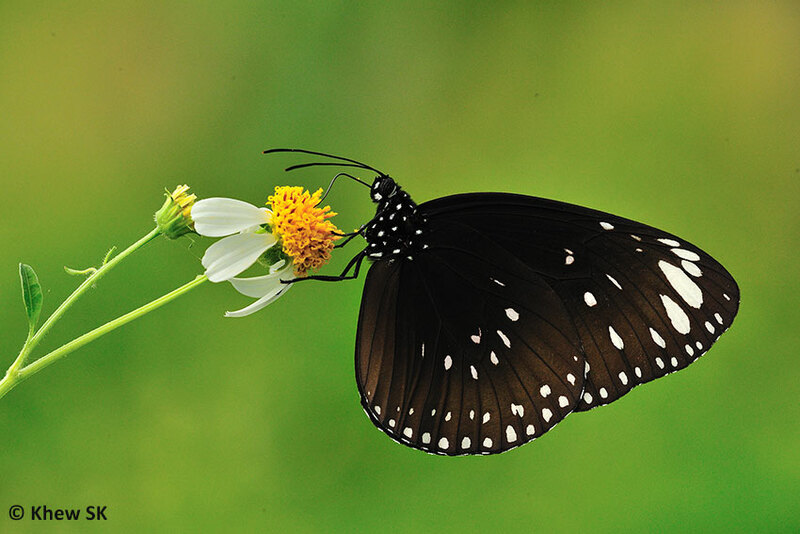 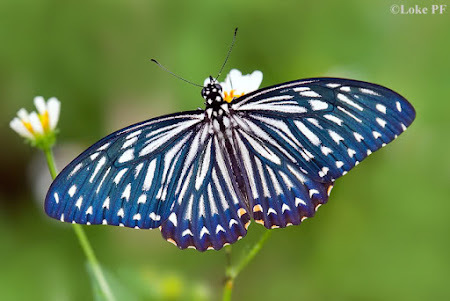 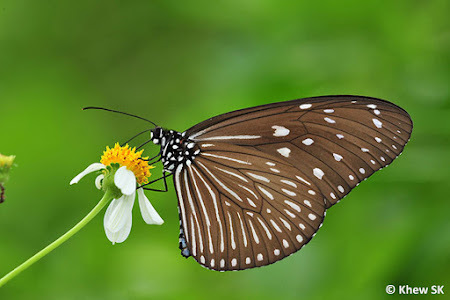 The large slow flying Tigers and Crows also feed on the flowers of the Spanish Needle - the weight of the butterfly often pulling down the flowers as they stop to feed with their wings folded shut. 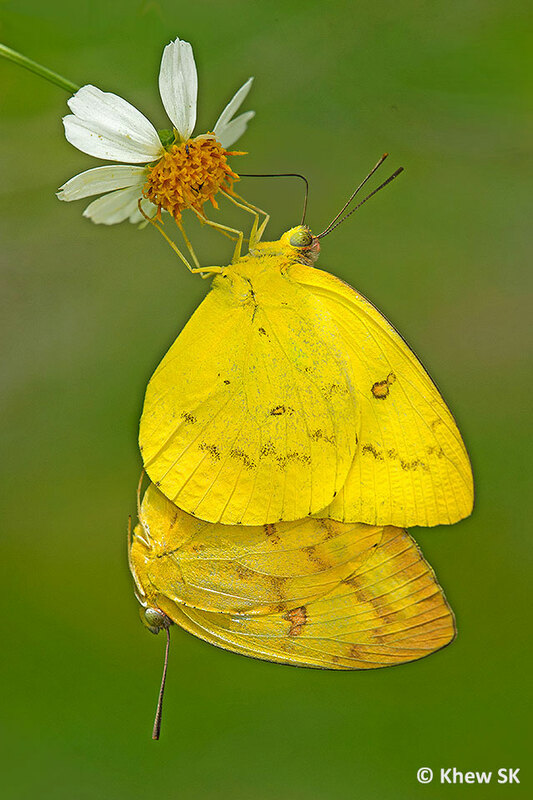 Unlike the Swallowtails, the Danainae butterflies stop completely and hold on to the flower whilst feeding. 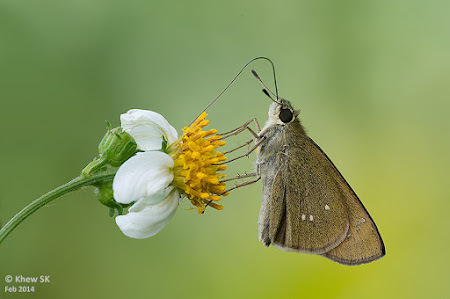 Amongst the Nymphalidae, a wide variety of the large and medium sized butterflies have been seen feeding on the flowers of the Spanish Needle. 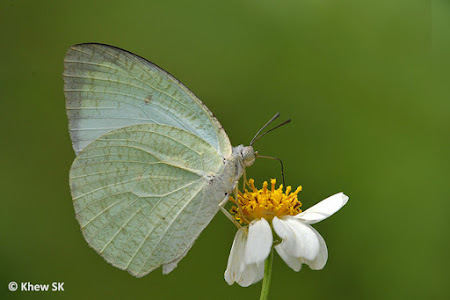 The Pieridae also take very well to the flowers of this high-nectar plant whenever available. Even the small Lycaenidae love the flowers of the Spanish Needle, stopping and feeding for long periods of time, probing their proboscis into each floret for the energy-giving nectar. 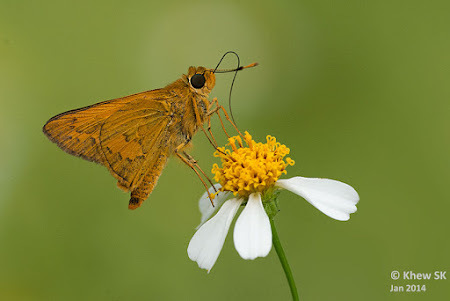 The speedy Skippers also join in on the flowers of this plant, angling their long proboscis into the flower. Although considered a weed by urban landscape designers and parks managers, the Spanish Needle is one of the all-time favourite nectaring plants for butterflies, and whenever you encounter a field of this plant with the pretty white/yellow flowers in full bloom, you can be sure that there are butterflies nearby, waiting to feed on the nectar that these flowers produce.